Da Marcella is the kind of restaurant that defies all odds, not unlike its owner Manuel Moreno, who readily concedes to having something of Don Quixote’s windmill-fighting pluck and idealism in him, inherited from his father and his mother. In a time where real estate prices and government regulations are squeezing most restaurateurs, Moreno is doing something of the impossible: he’s feeding his diners top-of-the-line Italian and Mediterranean dishes for ridiculously low prices. Not because he’s some kind of philanthropist, as some have speculated, but simply because he doesn’t believe in getting rich from feeding his neighbors, as he put it. 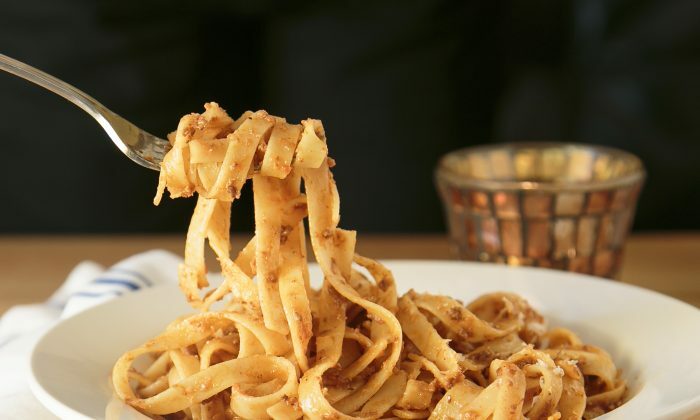 At the downtown location, a Tagliatelle alla Bolognese, with the depth and heartiness that only a slow simmer over eight hours can impart, and topped with shavings of parmiggiano, sells for $10. A Lasagna alla Bolognese costs $10. A Pappardelle alla Fiorentina, with smoked pancetta and cognac goes for $10. If you wanted to order one the most expensive items on the menu, you could try the excellent short ribs, braised in Barolo, and polenta, for all of $19. Same price for the roasted whole branzino with garlic and rosemary. The prices are set low, following a model native to Mediterranean Europe: the taverna. As a child, growing up first in Italy, and then in Spain, Moreno wanted to introduce this particular institution, the true incarnation of which he said he has not seen in the United States. In Italy, it’s the humblest and most rustic eating establishment of all, but most tavernas have been converted to moderately priced trattorias and osterias, he said. “A taverna is a neighborhood place where one neighbor is feeding the rest of the neighborhood, selling them the dish for maybe 20 percent more than it would cost the neighbors to cook,” he explained. With access to cheaper ingredients in bulk, a taverna owner would be able to purchase ingredients at half the price that townsfolk could. Overcharging would never go over well with the community in which the taverna owner was well and deeply embedded. It’s a remembrance of the past tinged with warm memories. “The taverna as I remember in Spain was a unique place, a fraternal place. Every time you move to a neighborhood the thing you miss the most is the taverna,” he said. “Maybe you are also secretly in love with the tavernero’s daughter,” he added. Woven into the fabric of community life, a taverna would be constantly filled with people: of those who stopped in for a coffee (and then a second one later), a beer, or to see what’s cooking that day and decide whether they’d eat at home or at the taverna. Most importantly, taverna owners are not in the business of enriching themselves. It seems like a quixotic endeavor to set prices this low in Manhattan. But Moreno meticulously set forward a plan starting 16 years before Da Marcella ever came to birth. From the beginning, he was set on according more of the operating budget to food—40 percent rather than the restaurant standard of 30 percent—to get higher quality, and organic, ingredients wherever he could. He doesn’t cut labor costs. Because of the higher volume, many of his staff are earning more than they did at their previous kitchen jobs. At the West Village location, he’s made some of the waiters partners in the business; their stake has made for increased motivation—and profit. Rather than approach the restaurant model from the point of view of scarcity, and “how much can I charge and get away with it” mentality, he has envisioned a win-all-around model. The ingredients in the pasta dish that are the most costly, the Tagliatelle Bolognese, cost him almost $3 per plate. He knows he’s not making the same profit charging $10. Da Marcella now has two locations in New York. In the West Village, the place is constantly packed to the brim. At the Midtown location, Moreno had to raise prices, as some hotels that were sources of referrals, as much as they liked the restaurant and the food, couldn’t bring themselves to refer their clients to a venue that served $10 plates. There prices run about $6 more per plate than the downtown location. If Moreno calls himself a dreamer, he said his late mother was even more so. Her model of generosity, of feeding neighbors, is a memory with staying power. Moreno recalls the hunger that haunted his childhood, of trying to go to sleep at 6 p.m., with the thought that if he were asleep, he wouldn’t be hungry. But his body couldn’t be fooled. He would wake up famished early in the morning, and tiptoe to his mother’s room, and call out to her in a whisper so his father wouldn’t hear. She would give him three-quarters of a roll of bread that she had saved for him. He would dunk it into milk and make a sort of soup out of it. Once a month, they were able to cook a white bean soup with chorizo. Moreno’s mother would set some aside for a couple, an out-of-work carpenter and his wife. When Moreno turned 13, and his sister turned 16, they found jobs, and the money they made helped the family immensely. They were able to make two large pots of food now, one for themselves, and one that his mother would give away or sell at a cheap price. When Moreno decided he would “serve the best pastas on earth at the most affordable prices,” it’s the memories of his mother’s generous spirit that drive him. “With pasta, you can have utopia,” he said. Many of the recipes used at Da Marcella are passed down from owner Manuel Moreno’s mother, who was Italian and an extraordinary cook. One of the most popular dishes is rightfully the soul-satisfying Tagliatelle alla Bolognese, with a meat sauce that’s been simmered for eight hours. ($10 at the West Village location; $9 lunch/$16 dinner in Midtown). Even though you could make this dish at home (in theory), who has eight hours to fuss over a dish? The artisanal pasta is carefully selected. In its dry state, it has the rough feel of sandpaper, created by bronze die. Once cooked, the texture of those micro-grooves and dents offer a surface for the sauce to cling to beautifully. Another of my favorites was the braised short ribs, a generous portion that is cooked in Barolo wine. [($19 at the West Village location; $18 lunch/$26 dinner in Midtown). The classic combination of complex red wine-braised ribs with simple, creamy polenta is a heavenly match: robust and hearty meet silky and smooth. At the Midtown location, and soon to be offered at the Village location, is paella, the pride of Spaniards, who Moreno said have been obsessed for 1,400 years with growing rice that will hold the most liquid possible without disintegrating. He uses bomba rice, which holds three times its volume in liquid. The chicken, seafood, and vegetables (10 different types) are good, but it’s the flavor of the rice—an amalgam of all those ingredients plus the aromatic sofrito that is the cooking base— that is delectable and keeps you digging for it. ($15 per person; paellas for one are available). The appetizers are varied: from moist meatballs to a salad of grilled marinated octopus with caper berries, tomatoes, and rughetta—simple, light, just the thing for summer. Desserts also range from lighter to heavier—from the light-as-air panna cotta with a berry sauce and the subtlest hint of aniseed flavor, to a creamy tiramisu, decorated with powdered cocoa stars, and a good old-fashioned Italian ricotta cheesecake. ($8 at the West Village location; $7 in Midtown). You’ll walk away full, and most likely your wallet won’t suffer much for it either.